Learn how to grow bell peppers in containers. 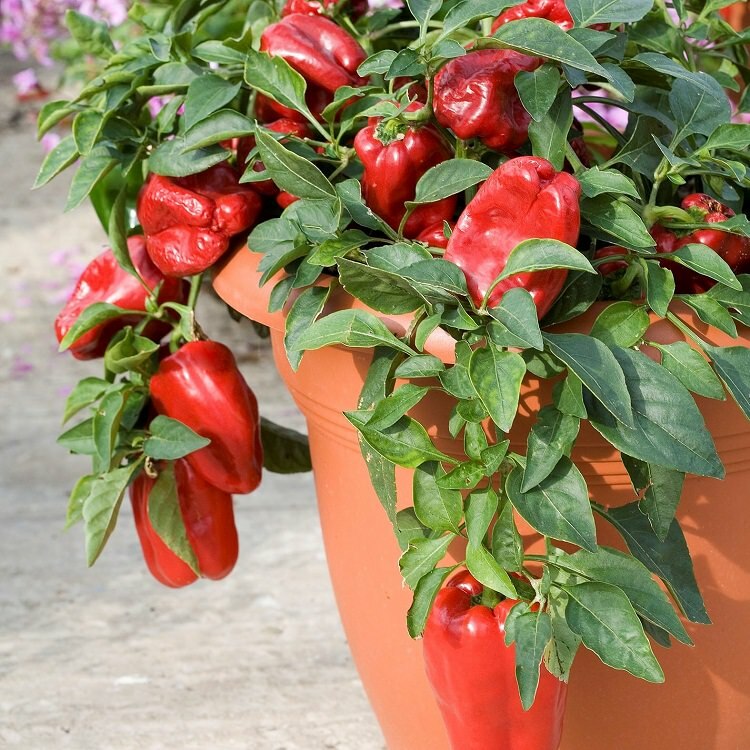 Growing bell peppers in pots is a great idea if you’re short of space or live in a cold temperate climate as it requires warm soil to thrive. USDA Zones— Pepper plants are short-lived perennials in tropics but in cold temperate regions, they are grown as annual. 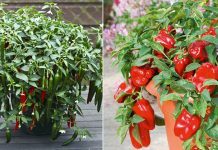 Due to the fact that the pepper is a warm weather vegetable crop and requires considerably more heat than cucumbers and tomatoes, growing bell peppers in pots is a great idea if you live in a cold climate. Growing bell pepper in the pot is easy. The first thing you have to do is to buy the plant from a nursery or propagate it from seeds. Planting bell pepper in containers requires a pot that is at least 10-12 inches deep and wide and has sufficient drainage holes. You can grow up to 2-3 plants (smaller varieties) in such a pot. Avoid using the black color container if you’re growing bell pepper in a tropical climate. 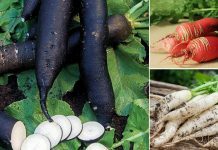 Buy good quality seeds from a local garden store or buy them online. Also, buy seed starting mix or make yourself. Fill small pots or seedling tray with the seed mix and plant two seeds in each pot, 2-3 cm deep. Start seeds 6-10 weeks before last spring frost date. Usually, in subtropical and tropical climate, you can start seeds anytime except in harsh summer. The seeds will germinate in 1 to 3 weeks depending on the weather conditions and seed quality. After they germinate thin out and only keep one plant per pot. When seedlings have 2 true leaves they are ready to be transplanted into the desired containers. Peppers love the sun. The most productive pepper plants are grown in warmth and heat. 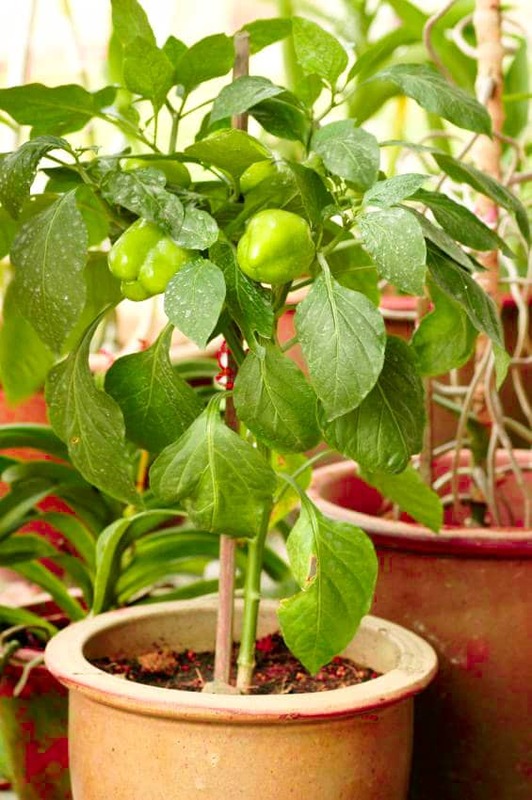 When you’re growing bell peppers in pots, keep them in a position that receives at least 6 hours of sunlight daily. That place should be sheltered from strong wind. Good soil is the key to productive pepper plants. Buy best quality potting mix that is well drained, loose and fertile or make your own potting mix. Potting mix must be rich in organic matter. Add well-rotted manure or compost in the combination of peat moss/coco peat and vermiculite or perlite (alternatively, sand). You can also add 5-10 gm neem cake at the time of soil preparation, it will protect the young plant from soil-borne diseases and pests. Growing bell peppers require regular watering to keep the soil slightly moist, soil should never dry out completely. In any case, avoid wetting the foliage, overhead watering may cause fungal infection. Water at the foot of the plant. Also, pepper plants suffer from overwatering so be careful that your plants don’t sit in water. Growing bell peppers require soil temperature above 60 F (15 C) for best growth. The optimum seed germination temperature is above 68 F (20 C). It can tolerate temperature up to 95 F (35 C) and down to 50 F (10 C) easily. The ideal growing temperature is between 70-90 F (21-32C). For your convenience and to reduce the evaporation of water, do mulching. Cover the base of the plant with organic matter such as leaves, pine barks, straws, paper or whatever that is readily available to you. Pepper plants like tomatoes are heavy feeders and you’ll need to fertilize the plant in every 15 days or so. When fertilizing, remember too much nitrogen-rich fertilizer can promote foliage growth. You can also feed the plant with tomato fertilizer. Also, once in a month feed the plant with compost or manure tea. Use of Epsom salt (2tsp/gallon water at the time of watering, you can also spray the plants with this solution) each month improves the health and increases the yield of tomato and pepper plants so it must be applied too. In the early stage, when the plant is young pinch growing tips regularly to make it bushier. Pruning is not necessary but can be carried out if required. If your pepper plant is flowering too early deadhead the flowers, it is important. This will direct the plant’s energy into growing and becoming healthy. You can also stop the formation of new fruits if you want to speed up the maturation of pepper fruits that are already growing on the plant by pinching off emerging flowers. Pepper plants are self-fertile so you don’t need to care about pollination but to get better fruits and to improve productivity you can gently shake the plants when they’re in bloom. You may need to support the plants. For this, either use tomato cages or simply poke a stick near the main stem and tie the plant to it. Growing bell peppers in pots require care from aphids as they are the number one enemy of pepper plants. In hot and dry weather you’ll also need to keep an eye on spider mites. Bell peppers are ready for harvesting in 60-90 days after transplanting. You can harvest them green when they reach full size and remain firm. If left to ripen, the color will change into orange, yellow or red. A Fact: Pepper is one of the richest sources of Vitamin C (more than the oranges). I got the bellpepper seeds from a bellpepper from the grocery… the seeds sprouted but died after about 10 days to 2 weeks. Am i doing something wrong? I used loam soil. Sounds like a condition called ‘damping off’ which is caused by various fungal pathogens and is usually due to overly wet or cool soil but can also exist on the seeds themselves. 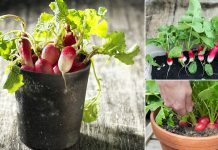 Best prevention is to use sterile soil (you can sterilize your own by using your oven) and sterilize your pots as well. Once they get a little size, a squirt with a homemade garlic spray helps to forestall fungus attacks. Interesting I had Never heard of it. Do you just use water with garlic ? I been using dish detergent with water and spray all over till dripping .. can see the white coating when leaves dry. Do it in 7-10 days again (3 total times usually is enough unless having rain but you can tell on leaves color etc). Leave them on the plant longer,they will eventually change color. I’ve read that basically all green bell pepper plants are the same as orange red etc,it’s just the length of time left on the plant. My peppers are growing quite nicely in 3-gallon grow bags but, today, it looks like I can see some of the roots at the top yet, there’s plenty of soil in the bag. Can they be transferred to a larger grow bag, with more soil added, and survive? Hey! Thanks for the article. I got seeds from the bell pepper (red and yellow) plants themselves, and they germinated really well. I want to transplant them into larger pots. Can I plant both types of peppers in the same pot? I am growing mini sweet peppers from the store. The little yellow,red,and orange ones.I grow on my balcony. What is good for the little white bugs that come after them when they start to grow peppers? I was suprised the seeds sprouted and not sure what will grow but I love suprises. I love growing my orange tree but this year they started having rot on the end like tomatoes do, any idea why? For the end rot, try adding a calcium source such as crushed eggshells and some epsom salt which is a source of magnesium. Thank you so much for posting this thorough, informative article. Buying bell peppers in the grocery store is expensive, so if we can grow these highly nutritious and delicious peppers at home it will be a great help — especially to people with limited or low income!